How do I care for and maintain my fence? You can power wash and/or seal your fence. We recommend using City Clean if you do not have the tools to do the project on your own. Click here to visit their website, or call them at 877.410.WASH (9274). Is there a product that you recommend to use if my PVC fence has been defaced with spray paint? An engineer approved product called "Graffiti Buster II" should be used in this case. The company who manufacures this items can be reached at 1(800)777-7870, or via their website (click here). What do I need in order to get a permit for my fence? This depends on the county in which you live, and is occasionally dependent on your city and/or community as well. We typically pull the permit for you, but ask that you provide us with your property plat with the location of the fence, style, height, and description noted. We will provide structural drawings and plans, as well as ICC codes and other miscellanious requirements. During the application process, we may request additional information. What happens when the gate latch miss-aligns or my gate does not open/close properly? Vinyl - Most the time it is a simple as adjusting the bolt portion of the hinge on a vinyl gate. Wood - If your wood gate misaligns, take a screwdriver and unscrew the "catch", then take a hammer and gently tap down until it aligns. 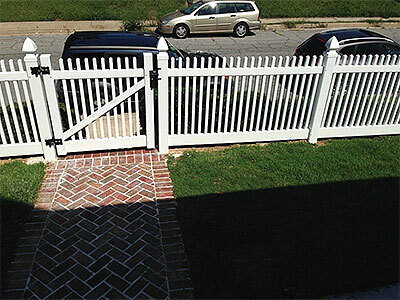 For more problematic gates, a professional might have to edge the gate(if wood) or actually re-hang a vinyl gate. Can I keep wood piles and debris stacked near my fence? In most cases, this will encapsulate moisture and create a problem. The over hydration of the wood will drastically accelerate rot decay and insect damage. If this stacked debris situation is likely to be inevitable, try to avoid cedar wood. Vinyl is a great alternative in this case, as it does not absorb any moisture and so the moisture will have little to no effect. Do I need a permit to build a fence in Anne Arundel County? Typically you will only need a permit if your fence is over 6' high, your property is waterfront, or your house is on a corner. For corner lots, the fence must be 25' or further from the corner so that it does not block the view of traffic. Waterfront fences must be 4' high or shorter in spans that are directly between the home and the water. They must also have 2.25" spacing to minimize view obstruction and to allow small animals to pass. Do I have to put the finished side out on my wood fence? 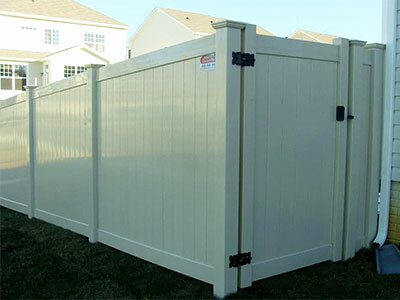 In Anne Arundel County Maryland, there is not a requirement for the finished side of the fence, although there are in many Home Owners Association covenants. Please be sure to get HOA approval with any construction project in your community. What is the product warranty and what does it cover? What’s the difference between pressure treated wood and cedar? Western Red Cedar is a beautiful naturally rot resistant material with no pressure treatment process necessary. This keeps the material much more dimensionally stable and alleviates much of the warping, twisting and checking seen in pressure treated material. As with any lumber product there will always be some degree of this but much less than pressure treated. Cedar is a bit more expensive depending on current lumber market conditions and will have a tendency to rot and decay if in ground contact or in a very wet environment where moisture is encapsulated. 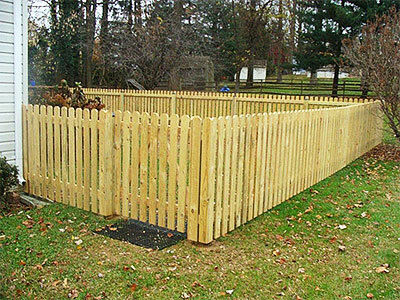 Our pressure treated fence board is a domestic southern yellow pine treated with an environmentally friendly pressure treated process giving it a lifetime above the ground warranty for rot decay and insects. You will not find bark, wane or decayed knots on our fence boards. We have even requested that the unsightly grade stamps be removed. By the pure nature of the pressure treated process the cell structure of the southern yellow pine is damaged to some extent. This is why pressure treated material has a tendency to warp, twist, and check. Do I need to get my lot surveyed? We highly recommend that you have your property professionally surveyed with any new fence installation and we can provide this service for a very reasonable rate. You can attempt to find the original survey pins w/ a metal detector. The survey pins are typically set w/ rebar and a plastic cap. Ultimately it is the homeowner’s responsibility to have their lot lines established. I have my property Plat, do I still need a survey? Yes, you may notice on your plat it is stated “Not to be used to establish boundary lines”. While they are typically very close, they are not intended to be exact. How close to the property line can I place my fence? Other than corner lot set backs there is no designation on how close you can install your fence to the lot line. If we have a staked survey we will typically set our fences back 4” to account for the footing. How deep in the ground do you usually set the posts? Typically, post depths extend 50% of the above-ground height. For example, a 4ft high fence would require footer holes that are 24” deep. 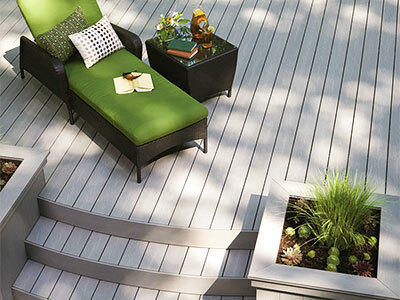 Yes, In most instances if you are building a new deck on your home, you will be required to have a county permit. Always check with your local permit and inspection office for regional code laws. Generally what you need is a copy of your property plat that clearly shows the house, including property lines. Indicate on the plat where the new deck is to be located on the property. You will also be required to fill out the application for a permit and there is a county fee involved. You will also need a drawing of the deck to scale that clearly shows the dimensions of the deck, footer size and depth, beam size, joist size and spacing, decking material to be used, railing system and staircase location if any. 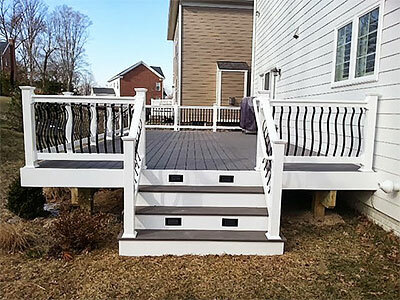 Yes, All contractors in the state of Maryland are required by law to have a Maryland State Home Improvement License in order to install any decking in Maryland. They should also carry general liability insurance and workers compensation so both you and your contractor are protected from any liability. Licensed contractors should gladly provide you with a copy of their home improvement license and a certificate of general liability and workers compensation insurance upon your request before any installation is to begin. Color fading, peeling, delaminating and splitting. Natural tendency of pressure treated wood to warp, twist and check that is not affecting the structural integrity of the deck. Includes rot, decay, termites and footings. Do I need to call Miss Utility? Miss Utility should always be called when digging, but we will take care of this step for you if we are doing the installation. Yes, you should always use caution in these situations. Grill mats are great, but be sure to check your decking specifications, as some PVC deck material may have a reaction with rubber mats. Why don't GeoDeck boards fade like other composites? Most composite products are made with wood flour or chips and plastic. The lignins found in wood products are a major contributor to fading. GeoDeck uses Biodac® rather than wood chips as its fiber source. Biodac has low amounts of lignins and consequently its GeoDeck products are more resistant to fading. Framing material generally consists of a #2 grade ACQ pressure treated southern yellow pine. ACQ stands for Alkaline Copper Quaternary which recently has replaced the old Chromated Copper Arsenate woods. ACQ is a waterborne preservative that is copper-based. The copper and quaternary compounds together provide protection from a broad spectrum of fungi and termites, preventing rot and decay. In most applications a treated 6x6 timber will be used as the main support posts. A back beam requirement is subject to the county in which you live in. Prince Georges County is one of them.